Last weekend I attended a workshop given by Catherine Zimmerman, author of the book Urban and Suburban Meadows and director of the movie Hometown Habitat. She totally inspired me on so many levels. First of all, she described her evolution from a suburban homeowner using chemical fertilizers and pesticides to achieve a “perfect” lawn to an advocate of lawn reduction and the creation of meadows. What caused her to change? It was the realization that she had killed all of the lightning bugs in her yard! (Click here for a fascinating article about lightning bugs.) She shared with us that 10 years ago she took the N.O.F.A./CT Organic Landcare Certification Course and was inspired by my friend Mike Nadeau to plant a meadow. The rest is history. 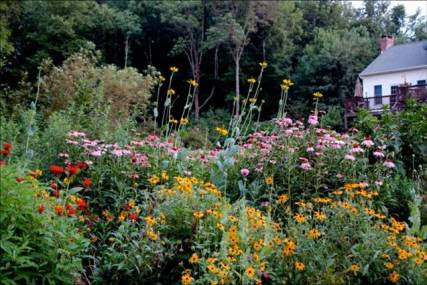 Catherine went on to become an enthusiastic proponent of planting meadows through her book, her movie, and her travels around the country speaking to communities about transforming wasteful lawn spaces to this rich, diverse habitat. What does this have to do with organic lawn care? As Mike Nadeau said: “Meadows are the exact opposite of lawns.” Each year at Natureworks we put together an updated version of our Organic Lawn Care Program. Please click here to download the pdf file. 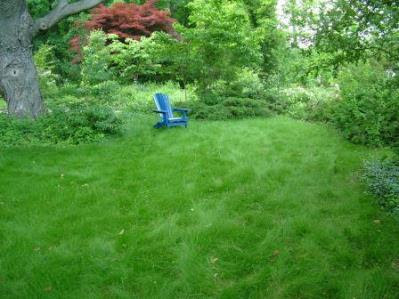 If you have a lawn that you want to care for, you absolutely must do so organically. 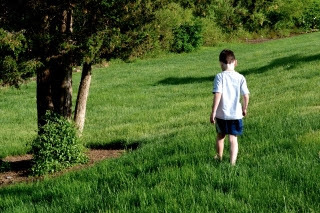 If not for the sake of your family who will be running barefoot on the grass, think of the birds, rabbits, earthworms, and other creatures, not to mention the myriad microscopic life forms beneath the soil surface that keep your soil healthy. But, when customers come into Natureworks and ask for enough organic fertilizer to feed a gigantic acre or more of lawn, it gives me pause. “Why do you have that much lawn to begin with?” I am tempted to ask. Oops. Sometimes I do! Why not convert some of your unneeded lawn expanses to a meadow, perhaps a hedgerow of native shrubs, add some evergreens to shelter the birds and wildlife. 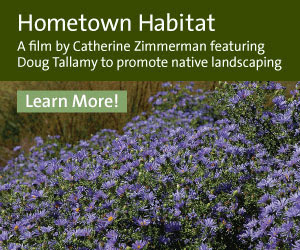 *To find out more about Catherine Zimmerman’s new movie Hometown Habitats, click here. To watch a YouTube video clip about meadows, click here.